‘His article is still relevant,’ Lyubov Potapova says. 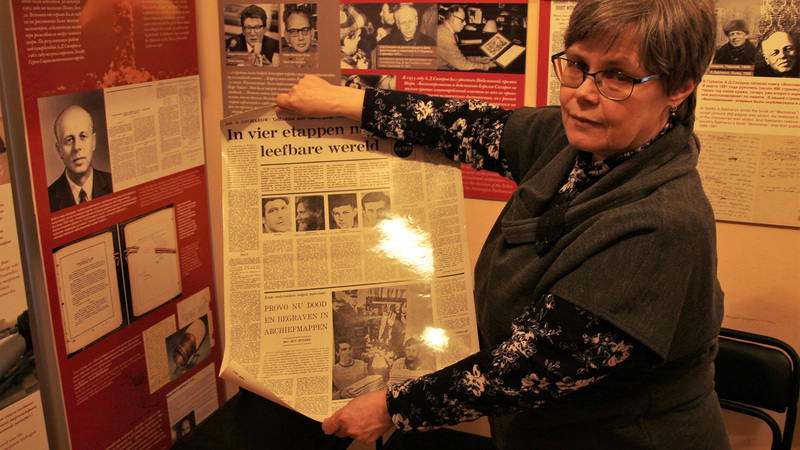 She walks away and comes back with a plasticised page of Het Parool (an Amsterdam-based newspaper) of 13 July 1968. 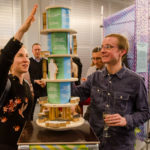 She unrolls the page on a table in the Sakharov Museum in Nizhny Novgorod, four hundred kilometres east of Moscow.The headline 'In four stages towards a liveable world' immediately catches the eye. It is the second and final part of the famous essay by Andrei Sakharov, the father of the Soviet hydrogen bomb. It is ten days after Russian President Vladimir Putin’s speech of early March in which he bragged about new supersonic nuclear weapons, when director Potapova gives a tour of the Sakharov Museum in Nizhny Novgorod. 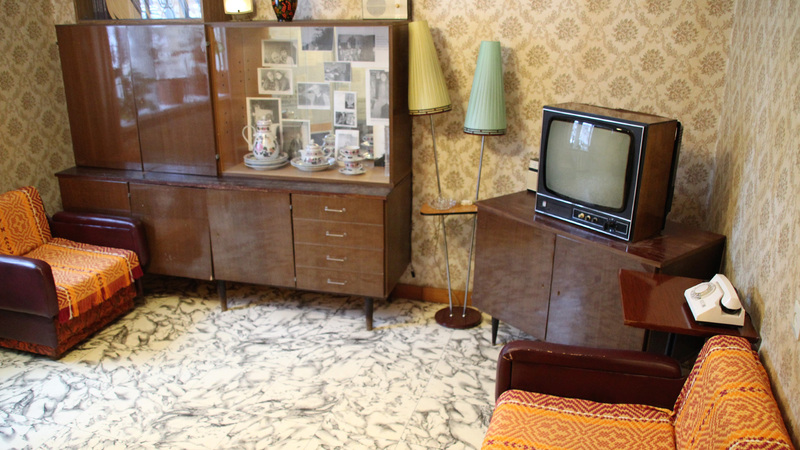 It is located in the four-room apartment to which Sakharov was banned in 1980 because of his persistent criticism of the Soviet regime. Potapova, guiding me through the hallway with at the end a portrait of Sakharov, points at his old living room and bedroom on the right side, with brown furniture, orange upholstery and a cabinet with family photos arranged just like back in the day. She stops in the exhibition space that shows Sakharov’s life story, told through newspaper articles, documents, photographs and anecdotes from Sakharov's autobiography. This is not a museum of touchscreens and tablets. When reading his essayThoughts on progress, peaceful coexistence and intellectual freedom, one cannot but be struck by the similarities with the world today. The nuclear scientist pointed out the danger of atomic weapons fifty years ago. He detested ‘spheres of influence’ and military aggression, and he criticised nationalism, extremism, dictatorships, dogmatism, and racism. Sakharov argued for intellectual freedom and not only fiercely criticised the lack of democracy in the Soviet Union but for example racism in the United States as well. And, not unimportantly, he offered solutions to solve those problems in four steps, among others by allowing socialism and capitalism to grow towards each other, as an alternative to the complete destruction of humanity. In the office part of the museum, Potapova puts biscuits, chocolate and tea on the table. Thoughtfully and carefully choosing her words, in the spirit of the former occupant, she takes the time to speak about the life and ideas of the man with whom she never talked, but who has profoundly influenced her life. Sakharov had written his essay because he understood that the time had come that he, as an intellectual, had to speak openly about the great questions of his time. As the father of the Soviet hydrogen bomb, he felt personally responsible. Through his work, Sakharov knew the totalitarian Soviet system well and understood the dangers of a regime that can act without opposition. Earlier that year, he had heard about the Prague Spring. He had felt the excitement, the hope and the enthusiasm about ‘socialism with a human face’. That same year, something remarkable happened in the Soviet Union as well. Sakharov called it a kind of ‘mini-version’ of the Prague Spring. After three dissidents had been convicted, a thousand signatures were collected in their defence. This was unprecedented under a suffocating regime. Sakharov’s essay came as a shock to the Kremlin. Moscow did not appreciate these dangerous ideas from a respected Soviet scientist who saw similarities between Stalin, who had won the Second World War, and Hitler. A scientist, moreover, who did not reject capitalism, Moscow’s ideological enemy. Two deadly sins. The authorities prevented the publication of the essay. It ended up in the samizdat (the underground literary circuit) and circulated within a small group. The essay went unnoticed by a wider audience. Without knowing him personally, Van het Reve made Sakharov world-famous. People outside the Soviet Union suddenly heard a different point of view from inside the closed-off Soviet bloc. And not just from anyone, but from the father of the Soviet hydrogen bomb, who had always been treated with respect in the Soviet Union. After Het Parool, The New York Times followed with a publication, and it was picked up by the rest of the world. ‘I remember that, according to the International Publishers Association, the total circulation of my piece in the years 1968-1969 was eighteen million; that made me end up in third place, after Mao Zedong and Lenin but before Georges Simenon and Agatha Christie,’ Sakharov wrote proudly. ‘The article completely changed Sakharov’s life,’ Potapova remembers. No longer ‘just’ a scientist, he became the humanitarian, enlightened conscience of the country. It gave the people who did not agree with the rulers in the Soviet Union a voice. In 1975 Sakharov received the Nobel Peace Prize. However, he was not allowed to leave the country to collect it. In 1979 Sakharov expressed his criticism of the Soviet invasion of Afghanistan to the foreign media. Again, his statements enraged the Soviet leaders, and the Kremlin put him and his wife in January 1980 on a plane for a one-way trip to Gorky, his place of exile. He ended up in a four-room apartment in a suburb of the city. Gorky (named after the Russian writer Maxim Gorky and known since 1990 as Nizhny Novgorod) was forbidden for foreigners because of the presence of military industry. The Kremlin did not want prying eyes, so no journalist could visit Sakharov. He did not get a phone. 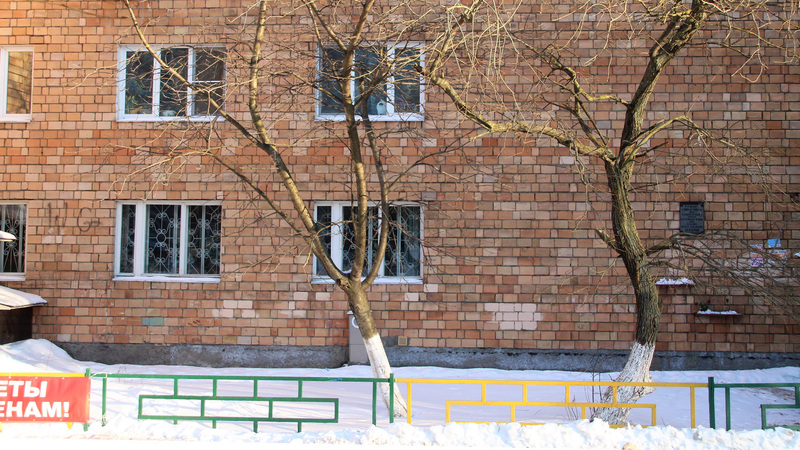 An agent guarded the front door and the KGB, the secret service, kept watch outside. 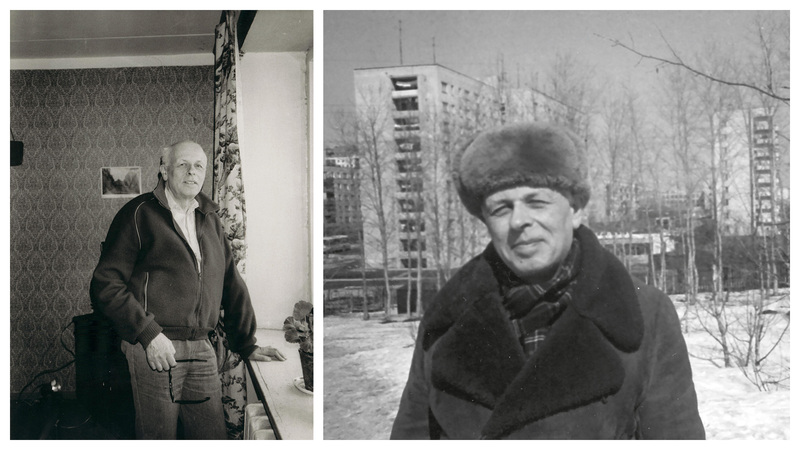 Whenever Sakharov left his apartment, he was shadowed by KGB agents. When he drove his car, he was followed, often even by two cars, aiming to intimidate him. ‘Sometimes they tried to scare us by creating a situation that could lead to an accident,’ Sakharov later wrote in his autobiography. In the evening of 15 December 1986, Sakharov’s doorbell rang. Two mechanics, accompanied by a KGB-agent, began to install a white phone. ‘Tomorrow around ten you will be called,’ the KGB-agent said when he left. The next day at three o’clock, just when Sakharov was about to get bread, the phone rang. Two days later, Sakharov and his wife took a train to the capital. Their release was coherent with the more open Soviet Union of new leader Mikhail Gorbachev. In Moscow, Sakharov was committed to reducing the number of missiles in Europe. He argued for the reduction of the Soviet army and pointed out the dangers of nuclear energy. In March 1989 he was elected to the new parliament but later that same year, on 14 December, he passed away. The people massively paid him their last respects. 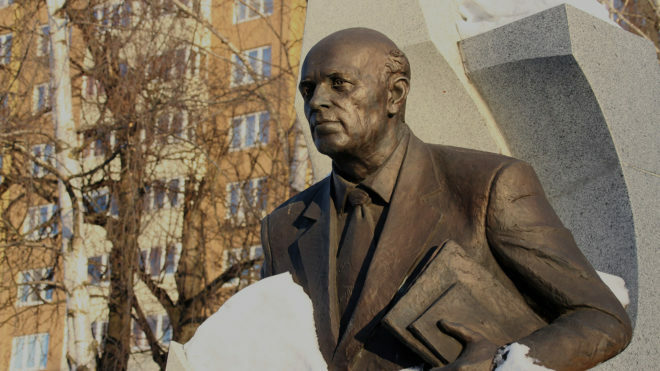 Two years later, the Sakharov Museum opened in his former flat in Nizhny Novgorod. Fifty years ago, the nuclear scientist emphasised the importance of a military equilibrium. No country should be superior to another. The temptation would be too great to carry out an attack. And in his relation to the West, it is precisely this point about which Putin regularly expresses his frustration. Sakharov also attached great importance to intellectual freedom, which enables the people to control and judge those in power, and which also provides fresh and new ideas. This article is based on an interview with Lyubov Potapova and conversations with Marina Sjajchoetdinova, chief curator of the Sakharov Museum in Nizhny Novgorod, and Sergej Loekasjevski, director of the Sakharov Centre in Moscow.In addition, there were conversations with Dmitri Soeslov, associate professor at the Department of Economics and International Relations at the Higher School of Economics in Moscow and program director of Valdai, a discussion club and think tank. Andrei Sakharov’s autobiography My Lifehas been usedas well.